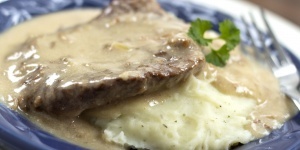 Easy slow cooker Swiss steak recipe that can be prepped in the morning and is ready to eat when you get home. 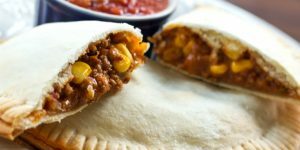 Easy Beef Empanadas make it look like you spent all day in the kitchen but are easy and delicious. They make a great freezer meal, too—make extra to freeze! If you keep cooked ground beef and sautéed onions in your freezer, you can have this easy soup on the table in under 15 minutes. 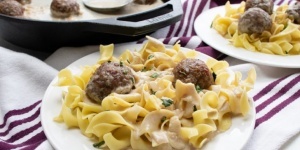 This super easy recipe is a quick stovetop meal prepared with just 5 ingredients: cooked meatballs, butter, onion, heavy cream, and balsamic vinegar. Serve over egg noodles and add a salad for a full meal. 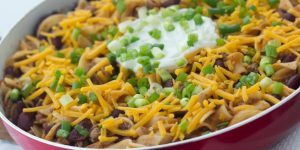 This southwestern style stovetop recipe from the Frugal Mom Menu is a quick and easy way to use up leftovers and canned ingredients that you have on hand. If your family likes spicier flavors, substitute enchilada sauce for the tomato soup and add a can of green chilies or tomatoes with green chilies. Other additions that work well are corn and black olives. 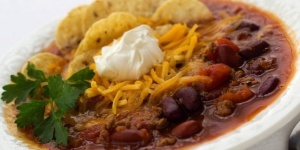 Although the recipe calls for kidney beans, black beans or red beans can be substituted. 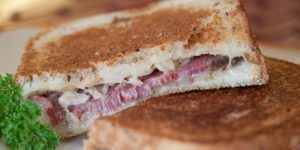 This Reuben Sandwich Recipe is a great way to use up leftover corned beef, or even to set the crockpot up to cook the corned beef and make the sandwiches in the evening. It’s a crowd-pleaser! Skillet Kielbasa is a quick and easy stovetop meal that is convenient to make. With just 4 ingredients, it’s a great alternative to the drive-thru. Looking for a quick and easy dinner? Take advantage of prepared foods to shorten your prep time in the evening. 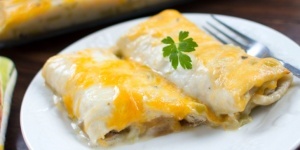 This yummy Tex-Mex dish starts with frozen burritos (you could make your own if you have more time and want a healthier option) and adds easy finishing touches to make it more like homemade.